Kansas State guard Christianna Carr (left) and Baylor’s Didi Richards fight for position in the first half of the Lady Bears’ win on Wednesday in Manhattan, Kansas. Baylor guard Chloe Jackson steals the ball and heads up court in the first half of the Lady Bears’ road victory on Wednesday. Jackson scored 16 points and had seven assists. Baylor forward Lauren Cox (right) blocks a shot by Kansas State forward Jasauen Beard during the first half of Baylor’s blowout win over the Wildcats. 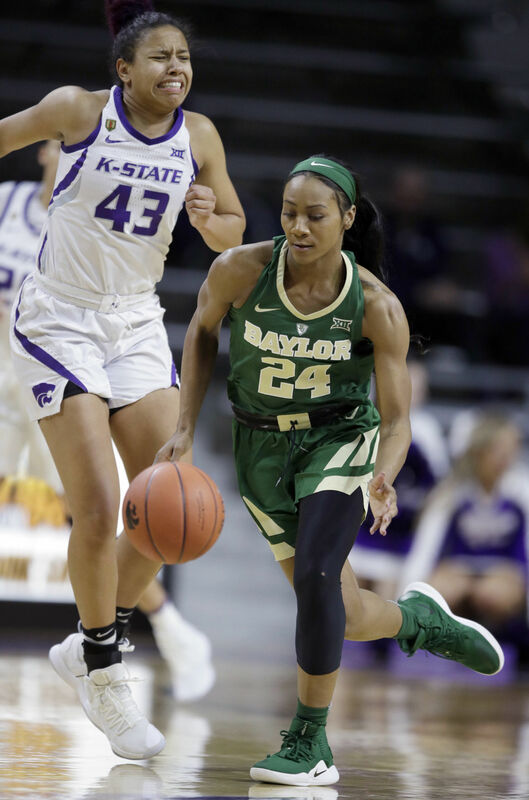 MANHATTAN, Kan. — Top-ranked Baylor showed off its versatility, as guards Chloe Jackson and Juicy Landrum carried much of the scoring load and led the Lady Bears to a road victory over Kansas State. Jackson finished with 16 points and seven assists and Landrum added 15 points and five assists, lifting Baylor to a 71-48 win over the Wildcats on Wednesday night at Bramlage Coliseum in Manhattan, Kansas. Kansas State attempted to crowd the paint and keep Baylor forwards Kalani Brown and Lauren Cox from dominating the game with easy baskets inside. No stranger to such tactics, the Lady Bears (22-1, 12-0 Big 12) answered with a barrage of mid-range jumpers. Baylor coach Kim Mulkey said that it often becomes a game of pick-your-poison for the Lady Bear opponents. Eventually, the Baylor frontcourt players got theirs too. Cox finished with 14 points, nine rebounds and five assists and Brown tallied 10 points and 12 rebounds. Forward Peyton Williams led Kansas State with 11 points and forward Jasauen Beard added 10. But Baylor held Kansas State (15-10, 6-7) to 27-percent shooting and 4 of 24 from 3-point range. Jackson took over midway through the first quarter with a steal and fast-break dish to NaLyssa Smith that resulted in two made free throws. Jackson kept it going with a mid-range jumper, another steal that she took in for an uncontested layup and an assist to Lauren Cox, who nailed a jump shot. Jackson’s momentum burst produced an 8-0 mini run that put the Lady Bears in front, 17-5, less than 8 minutes into the contest. Baylor led 21-9 after the first quarter. The Lady Bears extended their lead to 19 points in the second quarter when Jackson hit a jump shot on an assist from Cox with 2:40 left before halftime. Jackson and Landrum combined for 20 points in the first half as they shot 9 of 14 from the field. Landrum connected on her first five shots from the field, finally missing 37 seconds into the third quarter. BU’s defense harassed K-State into 29-percent shooting in the first half and the Wildcats made just 2 of 16 from beyond the arc in that time. The Lady Bears posted three blocks and four steals on their way to a 40-22 advantage at the break. With its 33rd straight Big 12 road win in the books, Baylor will return home to face Oklahoma at 7 p.m. Saturday.